Weiner Tales: It's *GASP* Another GIVEAWAY! I know! I wasn't supposed to post my next giveaway until Friday. But I got a little excited! This giveaway is for the pups...but still focuses on Cancer Awareness Month; kinda. Honestly, I had a bit of trouble finding good stuff for the pups. So, this is pretty much pink stuff for the puppers. I get an "A" for effort though; right?!?! Let's see what we've got, shall we? 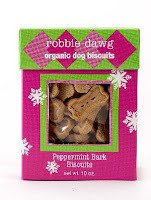 Robbie Dawg peppermint bark biscuits... Minty fresh dog kisses; YAY! A set of doggie hand towels. Wipe your paws, ladies! A paws and ribbons collar! Note on the collar: I haven't bought it yet. You all have different size dogs and different senses of style. When you win, I'll direct you to this site to customize your collar and I'll jump in and pay. You know I'd find something with the breast cancer ribbon on it! You get ONE entry for commenting on this post. You get ONE entry for following my blog. You get ONE entry for following me on Twitter. You get ONE entry for Tweeting about my giveaway. You get ONE entry for blogging about my giveaway or putting it on your sidebar.Please tell me what to give you credit for; I want you all to get the right amount of entries. Entries/comments need to be in by midnight EST on Tuesday, October 20th and the winner will be announced on Wednesday the 21st. What a great giveaway! Sign me up for 3 entries (I'm a blog and Twitter follower, too!). Have a great Friday! awesome giveaway... please enter me! Comment, follow, twitter, tweet, sidebar. Five for me! Woot woot! LOVE the pink puppy goodies! Awesome giveaway. Thanks for mentioning and remembering October is Cancer Awareness Month: It's so important for us women. This is such a great giveaway. I wonder if it would work for Timmy. Of course it would. What a GREAT giveaway!! My pooch, Cullen would LOVE these goodies!! forgot to say, I follow your blog, follow you on twitter, I also tweeted this giveaway! My Daisy girl needs a new collar. And what doggie doesn't love biscuits? I'm comment, I follow you, and I follow your Twitter. Three entries please, one for this comment, one for following this blog, one for following you on twitter! pretty please count me in!! have been following you on here! Cole, thanks for thinking of us pups too! Very sweet and a great giveaway. Please enter me for my comment and for following your blog. Hope you had a great weekend! ooohhhh.....I love Doggy stuff! I have 3 furpups, so I could really use it! And I LOVE that it benefits breast cancer research!!! and with this super sweet comment, that's 4 entries! Okay, here's my comment...not sure if I'll have time to do any of the others tonight, since I am feeling sick. But I just had to get at least one entry in for all that great stuff for my pooch! She would especially love the throw blanket! She's a blanket stealer! Thanks!!! Oh! I follow you too! Duh! Forgot about that! The FINAL Breast Cancer Awareness Month GIVEAWAY!